The most prominent among the many groups of peoples which gained importance in ancient Syria during the dark age period of the eleventh to ninth centuries BC were the Semitic Aramaeans. They were probably semi-nomadic pastoralists in northern Syria and northern Mesopotamia for a long time before 1200 BC. Naram-Sin of Akkad mentioned Aram as a place name, although where this was is a matter of debate. A people or place of Aram was mentioned by Mari in around 1900 BC, and Ugarit in about 1300 BC. Once states began to collapse at the end of the thirteenth century BC, the highly mobile and competitive Aramaeans took advantage of the confusion to raid and migrate throughout the region and eventually acquire political power in many cities. They maintained their tribal organisation and were subdivided into groups which were identified as belonging to the 'house of...'. In Akkadian this was 'Bit' plus the name of a person who was considered to be a tribal ancestor. Some of the states they founded were referred to in the first millennium by this designation, such as Bit-Adini. In northern Syria, Aramaeans took control of many cities, including some that were inhabited by people who maintained Hittite cultural and political traditions. In such places some kings had Luwian names, others Aramaic. Other cities were completely Aramaean and became the core of states such as Aram Damascus. By the ninth century BC, Aramaeans politically dominated the whole of ancient Syria. They also filtered down into Babylonia and Assyria, just as similar waves of migrant peoples had done for millennia. In the former state, while the few remaining cities were primarily Akkadian, the Aramaeans dominated the countryside. In Assyria they made political inroads into the cities, either taking on Akkadian names, or maintaining two names, one in each language. With political chaos engulfing Anatolia, Syria, and the Levant coast, and Assyria weakening, there is nothing to stop Aramaean tribes from migrating southwards and eastwards. Over the course of the twelfth to ninth centuries they mount attacks which destroy cities such as Qatna, and Qattara, and take control in many established cities, including Alep (Lukhuti), Aram-Nahara'im, Ebla, Hamath, Pattin, and Yadiya. They also found (or re-found) cities of their own, including, Aram-Bet-Rehob, Aram Damascus, Aram-Ma'akah, Aram-Sovah, Bit-Adini, Bit Agusi, Bit-Bahiani, Bit-Gabari, Geshur, Osroene, and Zobah, many of which became significant minor states. Aramaeans start to raid into northern Mesopotamia and south into Babylonia. One of their earliest kingdoms is Bit-Bahiani. The Assyrian king, Tiglath-Pileser I, has already been campaigning aggressively against them in an attempt to prevent them settling. A ruler of the Philistine city of Gath named Achish, who is probably the grandson of Achish, is mentioned in connection with two servants of Shimei who flee to him. Shimei goes to Gath in pursuit of them, in breach of King Solomon's orders, and is subsequently put to death by Solomon. Achish is said to be the son of Maacah, but this could instead mean that he is from a place called Maacah. There exists a small Aramaean kingdom of this name in northern Jordan, around the town of Abel Beth Maacah. This and Geshur are situated between Gilead and Mount Hermon, bordering the kingdom of Og in Bashan in the Old Testament. Maacah becomes an Israelite city following its conquest by King David, possibly as late as the 960s BC, around the time at which Achish is king in Gath. A king of Carchemish at this time bears an Aramaic name. 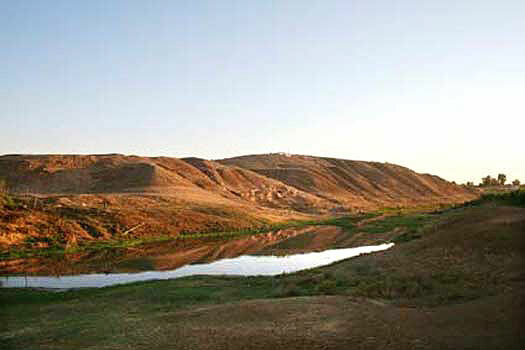 Occupying territories along the Tigris, Aramaean groups start to settle in Babylonia's countryside, taking control of it. Among the most important groups are the Gambulians and the Puqudians. They are joined there by a separate peoples, the Chaldaeans. Most Aramaean states are subjugated by the Assyrians, and their regional power is ended. They have developed a new method of writing since their acquisition of the skill, on parchment, leather, or papyrus, and have seen it achieve success. Now, around the middle of this century, their language, Aramaic, supplants ancient Assyrian, although in a heavily Akkadian-influenced manner. Aramaic is made the second official language of the Assyrian empire, and the language survives into the modern day.